January 24, 2019, 6:00 p.m.
Special Counsel Robert Mueller’s investigation has been going on for more than a year and a half – so far. Americans are more likely to approve than disapprove the Special Counsel’s work, but there is little that has changed in how the public views the investigation. In the latest Economist/YouGov Poll Americans take a partisan view of it. They are no more likely to believe Russia interfered in the 2016 election now than they have at any time in the last year. 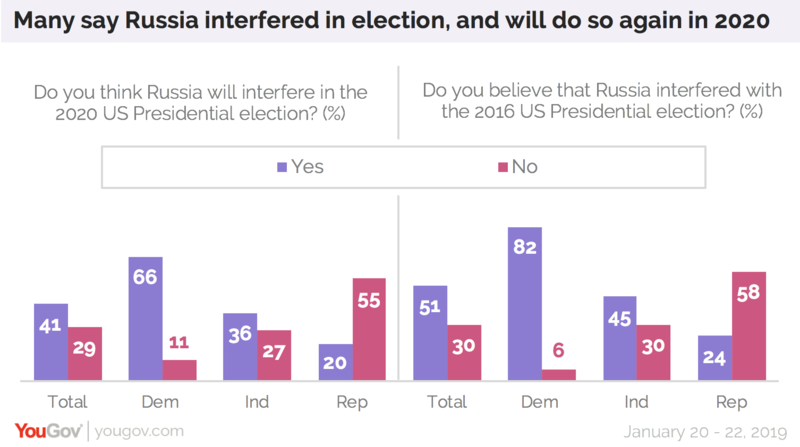 Four in ten (41%) Americans believe Russia will interfere in the 2020 election, while 51% believe that the country interfered in the 2016 election. The same was true during the 2018 campaign. In an August Economist/YouGov Poll, 40% of the public said they believed Russia was interfering in that contest, 26% disagreed, and a third weren’t sure what to think. The Special Counsel is investigating Russian interference specifically, but in the course of that investigation several Administration figures have pled guilty or have been convicted of crimes. 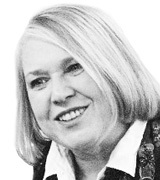 Several fare poorly as well in the court of public opinion. Most people, Democrat and Republican, hold unfavorable opinions of the President’s former campaign manager Paul Manafort and his former personal lawyer Michael Cohen. 54% of Republicans have an unfavorable opinion of Manafort, 55% are negative about Cohen. But just as Republicans reject the possibility of Russian interference in the 2016 election, they also reject the possibility of wrongdoing by both the President and his staff during the campaign and afterwards. Much of the overall public believes there was criminal behavior, but more likely by staff than by the President himself. A majority believes illegal activity took place in only one instance, by campaign staff before the election, but it’s a bare majority. In the current poll, 40% overall approve of how Robert Mueller is handling his job as Special Counsel, while 30% disapprove. A majority of Republicans disapprove (and three in four of them would use the President’s term for the investigation and call it a “witch hunt”). Republicans do have some confidence in the man who soon will supervise Mueller, Attorney General nominee William Barr. Although nearly half of Republicans currently have no opinion of Barr, nearly three times as many (38%) are favorable as unfavorable towards him (13%). As for the next election, there is doubt that the President can win again. Majorities believe he will complete his current term and run again in 2020, but just about half believe that he will not win that election. More than a third of Republicans agree. See toplines and tables results here.